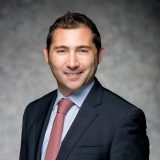 October 11, 2018 — Chris Gartman, a counsel in Hughes Hubbard’s Corporate Reorganization & Bankruptcy group, has been named to the American Bankruptcy Institute’s (ABI) “40 under 40” list, which recognizes 40 restructuring professionals nationwide under the age of 40 for their achievements at work and in their communities. Honorees were selected from more than 200 applicants by a 10-member judges’ panel of ABI leaders. They will be recognized at a special awards luncheon during the 2018 Winter Leadership Conference, to be held from Dec. 6-8 in Scottsdale, Ariz.
Gartman’s practice focuses on bankruptcy, restructuring and commercial litigation. He represents chapter 11 debtors, purchasers, equity holders and creditors in a wide range of matters. ABI is the largest, multi-disciplinary nonpartisan organization dedicated to research and education on matters related to restructuring. Founded in 1982 to provide Congress and the public with unbiased analysis of bankruptcy issues, the ABI includes more than 12,000 attorneys, accountants, bankers, judges, professors and other bankruptcy professionals as members.